Burn data, music or movies safely, and create backups. 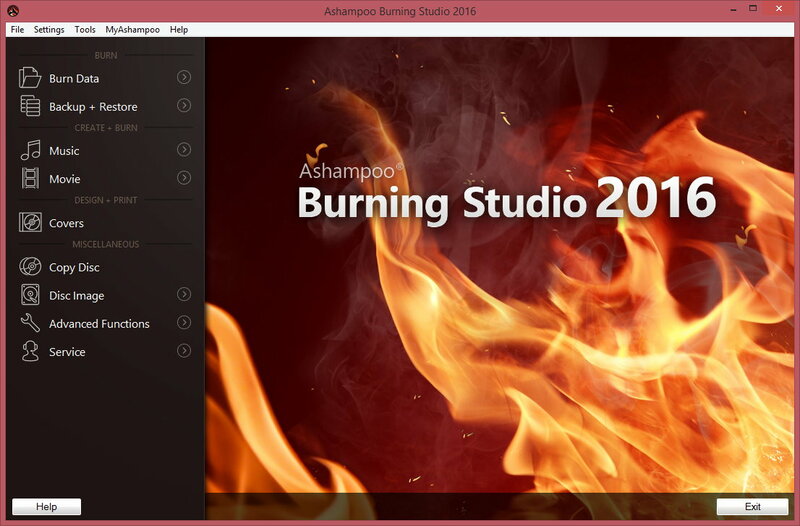 Ashampoo Burning Studio 2016 was available as a giveaway on January 14, 2016! 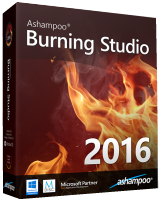 Ashampoo Burning Studio 2016 is the universal solution for everything burning-related. Burn data, music or movies safely, create backups or rip and burn music CDs. Create individual covers, retrieve CD titles and work with multiple themes. Copying discs is not a problem anymore even with on-the-fly modifications. Creating or viewing disc images is easy and even archiving large data sets spanning multiple discs is possible with disc spanning. The new Burning Studio 2016 supports new file formats and neatly integrates with Windows 10 supporting jump lists and notifications. The included support for M-DISC technology is ideal to create permanent and durable data archives, and backup external devices such as cellphones, flash drives or tablets make this a true all-rounder. How would you improve Ashampoo Burning Studio 2016? Why do people on here NOT read the posted comments? We get post after post asking the same inane and in some cases stupid questions and/or giving false information about the product! Do some correct and proper research before shooting off incorrect information to other users or do not comment! The product installed on Win 7 for me without any issues. I have not used their products for some years, so I will be interested in seeing how this version works and what features it has. This installed a secondary program (My Software Deals) without asking permission. It does not show up in the uninstall list nor is it easily recognizable in Explorer tree. Totally bogus move in my books. I'm uninstalling Ashampoo completely. Jim R, (My Software Deals) is NOT a secondary program, it is merely a Shortcut (ie. link) to their shop/store that every Ashampoo installation puts on your desktop. This is why you cannot find such a program anywhere in your system. Just dump it in the Bin and it is gone forever. No need to uninstall a good program over it. <b>Jim R</b> Jim R, (My Software Deals) is NOT a secondary program, it is merely a Shortcut (ie. link) to their shop/store that every Ashampoo installation puts on your desktop. This is why you cannot find such a program anywhere in your system. Just dump it in the Bin and it is gone forever. No need to uninstall a good program over it. This no good if you want to convert , for example, a downloaded video into a burnable dvd format. All it does is copy a format such as avi or mkv onto a dvd which very few dvd players recognize. It can however convert said files into VCD or SVCD ? Which also won't play on the majority of dvd players. Try Video to Video, its free and converts EVERYTHING you throw at it. This no good if you want to convert , for example, a downloaded video into a burnable dvd format. All it does is copy a format such as avi or mkv onto a dvd which very few dvd players recognize. It can however convert said files into VCD or SVCD ? Which also won't play on the majority of dvd players. Try Video to Video, its free and converts EVERYTHING you throw at it. Like NERO, Ashampoo Burning Studio Degenerated Into Bloatware. From the 1990s to 2010, I used NERO. It was the first and greatest Burning software. BUT with each new version, more bells & whistles were added until Nero become massive BLOATWARE with tons of frivolous features. In 2011, I switched to Ashampoo Burning Studio because it was more lightweight than NERO. By 2015, Ashampoo became excessively bloated with too many unnecessary features. In 2015, I switched to NERO Burning Essentials...wherein NERO went back to its roots of being the BEST burning software without all the extra garbage. Funny how things come full circle around. Like NERO, Ashampoo Burning Studio Degenerated Into Bloatware. From the 1990s to 2010, I used NERO. It was the first and greatest Burning software. BUT with each new version, more bells & whistles were added until Nero become massive BLOATWARE with tons of frivolous features. 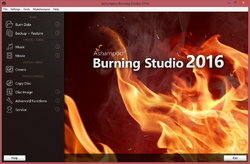 In 2011, I switched to Ashampoo Burning Studio because it was more lightweight than NERO. By 2015, Ashampoo became excessively bloated with too many unnecessary features. In 2015, I switched to NERO Burning Essentials...wherein NERO went back to its roots of being the BEST burning software without all the extra garbage. Funny how things come full circle around. I actually wasted my money buying this a while back. It was just plain useless. It told me that brand new dvd/rw's were no good, even though other burners had no problems, wrecked a LOT of CD's i attempted to burn, filled my mailbox with spam about other products, and threw pop ups at me constantly. No thanks. I'll stick with Burn Aware! The CD label printing feature does not allow printing 2 cds labels on one page. I have been asking for this feature for over 5 years. Why is it still not in the application? Fired up my Windows 7 32 bit VM where I can monitor all the changes made by installing, then updating Ashampoo Burning Studio 2016. Expanding the downloaded zip file, ran the Ashampoo setup.exe, which gave a dialog to get the key from Ashampoo. Entered the email address for my account with Ashampoo, entered the password when prompted, & the new key was displayed -- BTW, Ashampoo keeps those keys on record for future use, so if you need it, just log in. The program's install added 2289 files, 78 files deleted, 452 registry entries added. The number of files can be reduced slightly by deleting unneeded language files. The available update added 259 files, updated 367. I do not know if this was needed, but after updating I selected to register the program [under the Help menu], entering email & password at the web page that opened. Clicking to activate the program [also under the Help menu], a window popped up saying it was already activated & registered. You obviously get more than you pay for :) -- but what do you get? 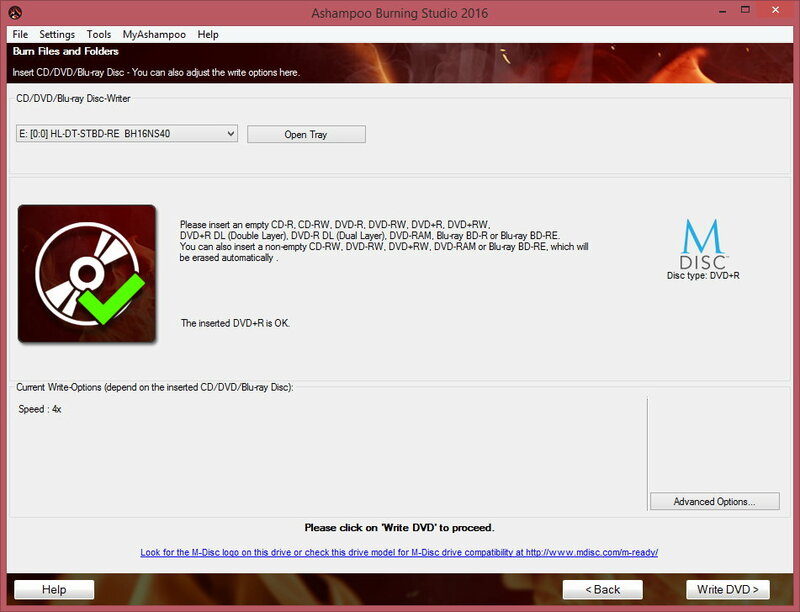 Ashampoo Burning Studio 2016 lets you burn data discs to CD, DVDs, & Blu-Ray. It let's you create VCD & SVCD discs -- if you know what those are you've been at this stuff a while ;) -- but will only do video DVDs & Blu-Rays using a DVD or Blu-Ray layout on your hard drive. For video DVDs that means the VIDEO_TS folder, e.g. 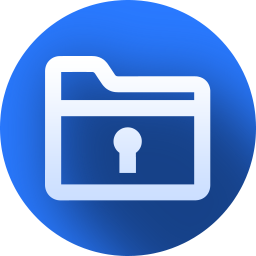 written by your authoring app, & for Blu-Ray that means the BDMV & CERTIFICATE folders. It also lets you create basic audio CDs, MP3 & WMA discs, copy music files to disc, & rip audio CDs. It includes a basic file backup function too, & lets you print disc labels, case inserts etc. Compared to ImgBurn, IMHO it's much easier to use, but that's mainly because you don't have all the options available in ImgBurn, which frankly can be confusing. OTOH I trust ImgBurn for more complicated stuff, like dual layer video DVDs. Actual burning is up to your drive(s), so there shouldn't be much if any difference from one app to the next. Ashampoo advertises m-disc support, but while that's honest, it doesn't mean much -- you need to buy a m-disc capable drive, & of course m-discs, to take advantage of the extra longevity m-discs offer. That said, burning m-discs is the same as regular discs. Burning Studio compares to the limited apps from Nero & Roxio -- not the full suites, which include video editors, DVD [& optionally Blu-Ray] authoring etc. Nero Express, included in the Nero suite, has more burning options, & is approximately as user friendly. There really shouldn't be any difference in terms of the discs you burn with Ashampoo, Roxio, or Nero -- in some cases ImgBurn *may* be more spec-accurate, & as mentioned, I believe it's better for dual layer video DVDs. Price-wise it's hard for me to imagine anyone paying list price for Ashampoo software, at least if you get their emails. That means the only thing cheaper than Burning Studio are free apps like ImgBurn. I haven't seen Roxio for a good price for quite a while -- Nero Platinum was running as low as $25 over the end-of-year holidays. Fired up my Windows 7 32 bit VM where I can monitor all the changes made by installing, then updating Ashampoo Burning Studio 2016. Expanding the downloaded zip file, ran the Ashampoo setup.exe, which gave a dialog to get the key from Ashampoo. Entered the email address for my account with Ashampoo, entered the password when prompted, & the new key was displayed -- BTW, Ashampoo keeps those keys on record for future use, so if you need it, just log in. The program's install added 2289 files, 78 files deleted, 452 registry entries added. The number of files can be reduced slightly by deleting unneeded language files. The available update added 259 files, updated 367. I do not know if this was needed, but after updating I selected to register the program [under the Help menu], entering email & password at the web page that opened. Clicking to activate the program [also under the Help menu], a window popped up saying it was already activated & registered. You obviously get more than you pay for :) -- but what do you get? Ashampoo Burning Studio 2016 lets you burn data discs to CD, DVDs, & Blu-Ray. It let's you create VCD & SVCD discs -- if you know what those are you've been at this stuff a while ;) -- but will only do video DVDs & Blu-Rays using a DVD or Blu-Ray layout on your hard drive. For video DVDs that means the VIDEO_TS folder, e.g. written by your authoring app, & for Blu-Ray that means the BDMV & CERTIFICATE folders. It also lets you create basic audio CDs, MP3 & WMA discs, copy music files to disc, & rip audio CDs. It includes a basic file backup function too, & lets you print disc labels, case inserts etc. Compared to ImgBurn, IMHO it's much easier to use, but that's mainly because you don't have all the options available in ImgBurn, which frankly can be confusing. OTOH I trust ImgBurn for more complicated stuff, like dual layer video DVDs. Actual burning is up to your drive(s), so there shouldn't be much if any difference from one app to the next. Ashampoo advertises m-disc support, but while that's honest, it doesn't mean much -- you need to buy a m-disc capable drive, & of course m-discs, to take advantage of the extra longevity m-discs offer. That said, burning m-discs is the same as regular discs. Burning Studio compares to the limited apps from Nero & Roxio -- not the full suites, which include video editors, DVD [& optionally Blu-Ray] authoring etc. Nero Express, included in the Nero suite, has more burning options, & is approximately as user friendly. There really shouldn't be any difference in terms of the discs you burn with Ashampoo, Roxio, or Nero -- in some cases ImgBurn *may* be more spec-accurate, & as mentioned, I believe it's better for dual layer video DVDs. Price-wise it's hard for me to imagine anyone paying list price for Ashampoo software, at least if you get their emails. That means the only thing cheaper than Burning Studio are free apps like ImgBurn. I haven't seen Roxio for a good price for quite a while -- Nero Platinum was running as low as $25 over the end-of-year holidays. For all those that have asked about the "Free update" to this giveawayoftheday burning studio 2016. It updates it to 16.02 and remains registered as a Full copy. So even though they say that there is no support or updates to the giveawayoftheday version, in this case it appears that an update was required to "Fix" some things. Cheers. This is great software. I have been using it since ver. 4 or so and have upgraded it regularly. I just bought this version for a co-worker with a new computer. I don't mind paying A-Shampoo for this software. I have paid a lot more for software that was worth a lot less than free. Apparently it will not work with XP. Too bad - seemed like a nice program. 2015 version is the last version that works on XP and XP x64. Later seem to need Vista or later. <b>Doug</b> 2015 version is the last version that works on XP and XP x64. Later seem to need Vista or later. Will this copy copy-protected dvd's so I can have my legitimate archive copy? Visit videohelp.com for a decent software listing, forums, tutorials etc. if you want something that'll handle that today -- otherwise wait until GOTD has a future offer on a DVD copy app [they've had a few in the past]. <b>Howard </b> Visit videohelp.com for a decent software listing, forums, tutorials etc. if you want something that'll handle that today -- otherwise wait until GOTD has a future offer on a DVD copy app [they've had a few in the past]. Much to my regret since upgrading to Windows 10, I can't burn anything using any third party apps, let alone Windows Media Player. Can anyone enlightening me what's went wrong? Just so you know, I've a great times using your last giveaway, Burning Studio 2014, before upgraded to Windows 10. And thank you in advance for your answers. Much to my regret since upgrading to Windows 10, I can't burn anything using any third party apps, let alone Windows Media Player. Can anyone enlightening me what's went wrong? Just so you know, I've a great times using your last giveaway, Burning Studio 2014, before upgraded to Windows 10. And thank you in advance for your answers. I have been on Win 10 since long before the public release that happened recently. When my wife did the free Win 10 Pro from Win 7 Pro some corrupted files were installed and she had similar problems. She was still in her 30 day period and did the automatic restore to her Win 7. She wasn't eager to go back to 10 when she got the free upgrade icon again but tried it anyway a day later. The upgrade went perfect and now all of our PC's are running Win 10 Pro. All of her programs now function normally! If you are beyond the 30 days you can go to the online help chat and they will either fix it with you or for you. <b>Zetty</b> I have been on Win 10 since long before the public release that happened recently. When my wife did the free Win 10 Pro from Win 7 Pro some corrupted files were installed and she had similar problems. She was still in her 30 day period and did the automatic restore to her Win 7. She wasn't eager to go back to 10 when she got the free upgrade icon again but tried it anyway a day later. The upgrade went perfect and now all of our PC's are running Win 10 Pro. All of her programs now function normally! If you are beyond the 30 days you can go to the online help chat and they will either fix it with you or for you. Look on Microsoft for a FixIt package. It might help. <b>Zetty</b> Look on Microsoft for a FixIt package. It might help. The only conversion is with audio, & *maybe* VCD/SVCD, but didn't check those last 2 out since I can't imagine anyone using those currently. <b>David Cooper</b> The only conversion is with audio, & *maybe* VCD/SVCD, but didn't check those last 2 out since I can't imagine anyone using those currently. Can I assume this is an upgrade compared to Burning Studio 2014 that I got here. Ermmm... so downloaded, installed, activated & registered as a Burn Studio 2016 user smoothly and painlessly... and am now at the point of perusing the program itself, but... my attention is immediately drawn to the little red circle encompassing the white number 3, which sits atop the service avatar found at the bottom of the menu column on the left of the UI. Upon mousing over said avatar, a side menu expands and splits the red circle into 3 separate avatars each with their own unique offer, the first of which being "Free Update Available! Ashampoo Burning Studio 2016 16.0.2" In the 'About...' information, it states this GOTD version as Version 16.0.0... so if we update from within the program (either today or thereafter), will that void the license we've been given today, and turn it into a trial version... or what? If you do the update of the files for this software it will be fine. They will offer your another uprade to a newer edition which would cost you but you need only decline that. <b>Sunnaze</b> If you do the update of the files for this software it will be fine. They will offer your another uprade to a newer edition which would cost you but you need only decline that. do not update any giveaway software, never ever! it will void your giveaway licence. Any giveaway, not only in Giveaway of the Day site. First thing to do after instalation is to logon to the software, look for preferences, or settings or any thingf similar to this and unmark automatic updates. Unless you liked so much the software that you want to by a licence. This is what the provider hopes to happen. Have happily used Versions 2010 and 13 previously and this is a worthwhile download if you're in need of a burner or could use the advanced features. Seems slower and less flexible than ImgBurn (for making disc images at least). I've not tested it in any other way. Thank you, Ashampoo and GOTD. Have happily used Versions 2010 and 13 previously and this is a worthwhile download if you're in need of a burner or could use the advanced features. Seems slower and less flexible than ImgBurn (for making disc images at least). I've not tested it in any other way. Thank you, Ashampoo and GOTD. Hi, can anyone comment on the advantages of Ashampoo Burning Suite over ImgBurn? There definitely the Extensive Movie editor is stripped off from this giveaway version, just simple discs burning and ripping features are left. Well, going to the Burning Studio product page I don't see Anything about editing video, nor do they list authoring video DVD or Blu-Ray. <b>Ewluka</b> Well, going to the Burning Studio product page I don't see Anything about editing video, nor do they list authoring video DVD or Blu-Ray. So, since this has the year rather than the version number in the title, does that mean this is NOT the full-featured version the link goes to but the always-free Burning Studio? If so, claiming that it normally sells for $59.99 is very unethical! If this is not the usual free version, I'd like to know how it is different. A comprehensive feature list would be very helpful. While I don't see a comparison chart, if you visit Ashampoo's site, they list the free version under their product menu -- check it out. There are a number of differences -- today's GOTD is not a scam. <b>Alyssa</b> While I don't see a comparison chart, if you visit Ashampoo's site, they list the free version under their product menu -- check it out. There are a number of differences -- today's GOTD is not a scam. How is this different in features from ImgBurn? 2016 is a allways-for-free cut-down-version of 16: https://www.ashampoo.com/en/usd/fdl and 16 is also a cut-down in comparison to 15 and there is another free version and a business version, if you have a look at the link I provided. What is the difference between "Burnaware Premium" & "ABS 2016"? Which one is better? Can't burn your own home movies in BluRay. Tried adding .m2ts 3d files from my 3D camera. Software is looking for other missing files from a movie disc. Thought I'd give this a try to see if its any easier to do. Did the software updates and still works. No big deal if it voids its-self as probably will dump it anyway as have a few other burning software that works just fine. Can't burn your own home movies in BluRay. Tried adding .m2ts 3d files from my 3D camera. Software is looking for other missing files from a movie disc. Back to Sony's PlayMemoriesHome software (which is free btw).... Thought I'd give this a try to see if its any easier to do. A hassle to get a password to get the key. Had to select 'forgot password' and go through resetting password procedure to get one as had no account... Did the software updates and still works. No big deal if it voids its-self as probably will dump it anyway as have a few other burning software that works just fine. 1st off I can't say whether the files from your camera are compatible with the Blu-Ray spec -- likewise I don't know what software & stand-alone players they're compatible with. If you want to move beyond your PlayMemoriesHome I'd suggest you research that first, as that might help you get the best quality & avoid wasting time & effort. Ashampoo's Burning Studio 2016 Will Not author video DVD or Blu-Ray layouts or discs. For that you need an authoring program -- videohelp.com might be useful to you. That authoring app will either create an ISO file or a set of files that burning software can burn to disc. <b>Elad</b> 1st off I can't say whether the files from your camera are compatible with the Blu-Ray spec -- likewise I don't know what software & stand-alone players they're compatible with. If you want to move beyond your PlayMemoriesHome I'd suggest you research that first, as that might help you get the best quality & avoid wasting time & effort. Ashampoo's Burning Studio 2016 Will Not author video DVD or Blu-Ray layouts or discs. For that you need an authoring program -- videohelp.com might be useful to you. That authoring app will either create an ISO file or a set of files that burning software can burn to disc. I have been buying the updates for the last 10 years, now I can load it FREE on my other computers and tell my friends about the offer..
What I thought was odd was the offer for a free upgrade to 16.0.2, which is free to try, but the GOTD offer clearly says no free upgrades to future versions. Would upgrading blow my licensed version back to a "free to try" version ? It's OK. It's just bug fixes. Download website is offering 16.02 for free. <b>Mike Ritter</b> It's OK. It's just bug fixes. Download website is offering 16.02 for free. The prices are reasonable and the software functions well and a bargain for the money. I checked. and already have studio 16. It is Ashampoo Burning Studio 2016 - Version 16.0.0 - [16.0.0.17 (4610)] The install file for today's giveaway shows this to be the same as what I have 16.0,0. This is a very good program. OK, downloaded and installed... oh so easy.... it is version Version 16.0.0 - [16.0.0.17 (4610) same as what I have. I opened my present program and suddenly an ad for the "Premium 2016" popped up... enhanced. For my needs what I have is OK. There is a 16.4 newer one... but why do i need it? Cnet ratings are good, so do I.
I recall when burning programs were VERY expensive.... Ashampoo works well and simple to use. Personally I like this company and their products. The Slideshow program in my experience is one of the best tho not expensive. The prices are reasonable and the software functions well and a bargain for the money. I checked. and already have studio 16. It is Ashampoo Burning Studio 2016 - Version 16.0.0 - [16.0.0.17 (4610)] The install file for today's giveaway shows this to be the same as what I have 16.0,0. This is a very good program. OK, downloaded and installed... oh so easy.... it is version Version 16.0.0 - [16.0.0.17 (4610) same as what I have. I opened my present program and suddenly an ad for the "Premium 2016" popped up... enhanced. For my needs what I have is OK. There is a 16.4 newer one... but why do i need it? Cnet ratings are good, so do I. I recall when burning programs were VERY expensive.... Ashampoo works well and simple to use. Personally I like this company and their products. The Slideshow program in my experience is one of the best tho not expensive. Another Ashampoo Giveaway. Great products however I always seem to have a problem with them reverting back to ‘unregistered’ products. This includes both ‘giveaways’ and products purchased directly from their website. This being although I don’t update, I don’t run cleaners and as an extra precaution I always install ‘giveaways’ to a parent folder called giveaways to make doubly sure not to update them. I always keep a copy of my registration information but trying to re-register a product usually doesn’t work for giveaways. On purchased products, a pop-up widow appears saying that code was already used. To their credit, Ashampoo customer support is good to take care of reestablishing registration but what a hassle having to go through the entire process of emailing back and forth with each individual product at a time. It would be nice to be able to do it in bulk. Anyway, thanks Ashampoo and giveawayoftheday. I state "It would be nice to be able to do it in bulk." as I have over a dozen purchased Ashampoo programs. I do like their products. Been using various versions of ashampoo burning studio for quite a few years now. I've tried some of the other burning softwarej available and keep coming back to ashampoo. Easy to use, perfect results and also will copy some of my old scratched & unreadable CD's. Will certainly grab this nice freebie from GOTD . Been using various versions of ashampoo burning studio for quite a few years now. I've tried some of the other burning softwarej available and keep coming back to ashampoo. Easy to use, perfect results and also will copy some of my old scratched & unreadable CD's. Will certainly grab this nice freebie from GOTD . I went to the publishers website. I was unable to find Burning Studio 2016. I did find Burning Studio 16. Could the publisher explain the difference between the two programs? You can buy Burning Studio 16, the latest update of which -- 16 .04, on 16 December last -- will cost you $59.99 at full retail. Or you can obtain for nothing, Ashampoo's stripped-down free version: Burning Studio 2016. Ashampoo doesn't really help itself -- or anyone else -- when it comes to accurately describing its giveaways. This page, for instance, categorically states that Ashampoo Burning Studio 2016 costs $59.99. Of course it doesn't. As a commercial product, Burning Studio 2016 doesn't even exist. What should be borne in mind, however, is this. Ashampoo is a generally excellent developer. Its Burning Studio program long since de-throned the expensive Roxio and the hopelessly bloated Nero. I've used Burning Studio for years and wouldn't dream of using anything else. I also have a selection of other Ashampoo commercial products . . . for none of which I've ever paid anything like the so-called "retail price". That's because, if you download an Ashampoo free product (like Burning Studio 16) you can register it and have your own Ashampoo account . . . and Ashampoo will then regularly notify you of its heavily discounted offers. You'll also pay the real retail price for an Ashampoo product, not the inflated one that's attached to products primarily for marketing purposes. Ashampoo's business model then is to attract customers with giveaways and then hang onto 'em with a seemingly unending range of special offers as well as "member" prices that are half the alleged retail prices. The paranoid, as well as those who haven't much clue how to use a computer, will of course tell you that registering with Ashampoo -- becoming a "member" -- will expose you to Ashampoo spam which you can't possibly control. Rubbish. Of course you can. Takes 2 minutes to organise server side filtering. However: if you do indeed do that, then yes, you will miss out on some excellent deals. I, for instance, have an earlier version of Burning Studio which cost $19.99 instead of $49.99. And I've now just purchased from Ashampoo, some specialist image manipulation software created by its partner developer, BenVista. As an Ashampoo "member", I've bought it for 75% less than BenVista would've charged me direct. As ever and always then, it's your choice. Where Ashampoo is concerned, all that necessary is think VERSION number if you're talking about an Ashampoo paid-for product and think YEAR number if you're talking about an Ashampoo free product. Simples. <b>brenda</b> Ashampoo's naming policy for its products is quite straightforward. A product <b>that is on sale</b> is identified by a version number. A product <b>which isn't on sale</b> is identified by a year number. Thus: You can <b>buy</b> Burning Studio <b>16</b>, the latest update of which -- 16 .04, on 16 December last -- will cost you $59.99 at full retail. Or you can obtain <b>for nothing,</b> Ashampoo's stripped-down free version: Burning Studio <b>2016</b>. Ashampoo doesn't really help itself -- or anyone else -- when it comes to accurately describing its giveaways. This page, for instance, categorically states that Ashampoo Burning Studio 2016 costs $59.99. Of course it doesn't. As a commercial product, Burning Studio 2016 doesn't even exist. What should be borne in mind, however, is this. Ashampoo is a generally excellent developer. Its Burning Studio program long since de-throned the expensive Roxio and the hopelessly bloated Nero. I've used Burning Studio for years and wouldn't dream of using anything else. I also have a selection of other Ashampoo commercial products . . . for none of which I've ever paid anything like the so-called "retail price". That's because, if you download an Ashampoo free product (like Burning Studio 16) you can register it and have your own Ashampoo account . . . and Ashampoo will then regularly notify you of its heavily discounted offers. You'll also pay the <i>real</i> retail price for an Ashampoo product, not the inflated one that's attached to products primarily for marketing purposes. (For example: Ashampoo Burning Studio 16 does have a stickerl price of $59.99. But if you log into Ashampoo's website today as a "member", the price is. . . $29.99.) Ashampoo's business model then is to attract customers with giveaways and then hang onto 'em with a seemingly unending range of special offers as well as "member" prices that are half the alleged retail prices. The paranoid, as well as those who haven't much clue how to use a computer, will of course tell you that registering with Ashampoo -- becoming a "member" -- will expose you to Ashampoo spam which you can't possibly control. Rubbish. Of course you can. Takes 2 minutes to organise server side filtering. However: if you do indeed do that, then yes, you will miss out on some excellent deals. I, for instance, have an earlier version of Burning Studio which cost $19.99 instead of $49.99. And I've now just purchased from Ashampoo, some specialist image manipulation software created by its partner developer, BenVista. As an Ashampoo "member", I've bought it for 75% less than BenVista would've charged me direct. As ever and always then, it's your choice. Where Ashampoo is concerned, all that necessary is think <b>VERSION</b> number if you're talking about an Ashampoo <b>paid-for</b> product and think <b>YEAR</b> number if you're talking about an Ashampoo <b>free</b> product. Simples. I'm a user, I am not with Ashampoo. I have paid for an earlier version of their full burning program, and it was worth it to me. These three differences have been steadily improved with each new version of the pay version. Particularly the speed of converting a MP4/AVI/MOV into the DVD-video format before burning. For burning data CDRs or DVDRs or BR-Rs, both versions are the same. The free versions also will burn video DVDs from videos that have been converted to the DVD format, and there are other free programs to do that but not from Ashampoo. That is difficult if you don't know what to do. The pay version of this program does it automatically. Also both free and pay versions have a CD ripper to make MP3s from your CDs. You can install this free version and it never expires. On their website you can download the trial version of the pay version, and it works fully for 30 days then expires unless you pay for it. You can try the extra video features fully with no limits for the 30 days. <b>brenda</b> I'm a user, I am not with Ashampoo. I have paid for an earlier version of their full burning program, and it was worth it to me. In the past few versions, the main difference between the free version (with a whole year in the name) and the pay version (with a version number in the name) is that the full pay version includes extra features for making DVD-videos and video editing: In the pay versions: - you can drag video files into the movie burner, like MP4, AVI, MOV, and the program will convert them to DVD-video or Blu-Ray-video format and burn a video disc - has a workable video editor/trimmer - has more skins and graphics for creating a video disc menu These three differences have been steadily improved with each new version of the pay version. Particularly the speed of converting a MP4/AVI/MOV into the DVD-video format before burning. For burning data CDRs or DVDRs or BR-Rs, both versions are the same. The free versions also will burn video DVDs from videos that have been converted to the DVD format, and there are other free programs to do that but not from Ashampoo. That is difficult if you don't know what to do. The pay version of this program does it automatically. Also both free and pay versions have a CD ripper to make MP3s from your CDs. You can install this free version and it never expires. On their website you can download the trial version of the pay version, and it works fully for 30 days then expires unless you pay for it. You can try the extra video features fully with no limits for the 30 days. Numbers are sometimes confusing. Thanks for this clear explanation ! <b>MikeR</b> Numbers are sometimes confusing. Thanks for this clear explanation ! Yeah, they offer some nice bargains and quite handy tools, for the situations where you don't need the full-blown special-apps. Ashampoo is more expensive as Roxio (original price) and Nero can 10 x more - for me is Ashampoo unusable because it can not handle files from WMC and many other formats and can only burn DVD with max. 4 hour. Ashampoo and the products from their "partner developers" have not the quailty that I want. <b>MikeR</b> "expensive Roxio and the hopelessly bloated Nero": Ashampoo is more expensive as Roxio (original price) and Nero can 10 x more - for me is Ashampoo unusable because it can not handle files from WMC and many other formats and can only burn DVD with max. 4 hour. "you will miss out on some excellent deals": Ashampoo and the products from their "partner developers" have not the quailty that I want. "... Ashampoo unusable because it can not handle files from WMC and many other formats and can only burn DVD with max. 4 hour." The 4 hour limit depends on the disc settings you make. OTOH anything over 2 hours on a video DVD should use a dual layer blank -- otherwise quality is horrendously bad -- & for that you'll probably want to use ImgBurn. As far as different video formats go, today's GOTD Is Not a converter -- it only burns video DVD/BD that's already been prepared for burning. <b>Luke</b> <i>"... Ashampoo unusable because it can not handle files from WMC and many other formats and can only burn DVD with max. 4 hour. "</i> The 4 hour limit depends on the disc settings you make. OTOH anything over 2 hours on a video DVD should use a dual layer blank -- otherwise quality is horrendously bad -- & for that you'll probably want to use ImgBurn. As far as different video formats go, today's GOTD Is Not a converter -- it only burns video DVD/BD that's already been prepared for burning. Unfortunately for me, just purchased Ashampoo BS 2016 a few days ago... Install without problems on Windows 8.1 and works perfectly. Lot of features, but not supported on systems older than Windows 7. Complaining about free stuff is not cool. And the spamming can be stopped with an email request, can it not? <b>Allan</b> Complaining about free stuff is not cool. And the spamming can be stopped with an email request, can it not? Stan You can't have "purchased" Ashampoo Burning Studio 2016. It doesn't exist as a commercial product. 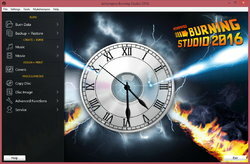 If you instead purchased Ashampoo Burning Studio 16, then you have a fully functional, fully featured burning program. <b>Stan</b> You can't have "purchased" Ashampoo Burning Studio 2016. It doesn't exist as a commercial product. 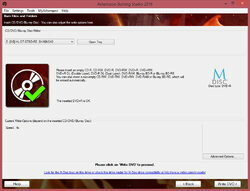 If you instead purchased Ashampoo Burning Studio 16, then you have a fully functional, fully featured burning program.